Two wild gibbons have a professor and a pop star to act as high-tech matchmakers! The story is of spectacular wildlife and is as dramatic as any opera. Our young would-be lovers are Skywalker Gibbons, a new species announced in 2017, and an ape like us. There are only a handful left, scattered in the spectacular Gaoligong Mountains on the China-Myanmar border. 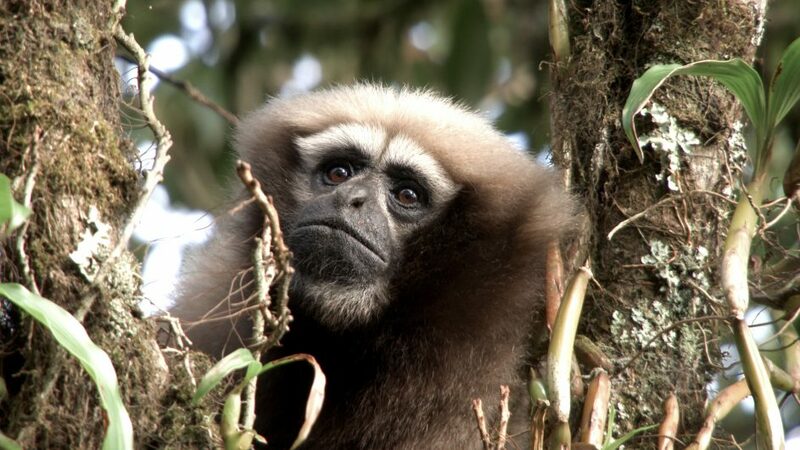 A gibbon’s life revolves around song, and their calls can be heard for miles. A lone female sings across the jungle in the hope of winning a life-long partner. A single male lives twenty miles away – but they can’t find each other over the huge terrain. It’s a crisis for a new and important species – and calls for an extreme solution. Because without them singing a duet across a valley, they will never become a couple. It started as a crazy idea from a Beijing pop star and the leader of the research team on Skywalker Gibbons. Musician Xingyu Lee and Professor Fan have designed and built a system to allow gibbons to sing together. Speakers and microphones connect two locations, and the gibbons now can sing to each other. In human terms, they have an effective dating app – and it has the gibbon scientists of the world buzzing. But there are many practical problems to overcome. Poachers and impoverished farmers live here, and, amazingly, Fan enlists them to help, alongside local park rangers, city tech companies and international conservationists. Professor Fan is determined to make an all-wild match. In a first attempt, he hooks up a wild pair by telephone. They duet, and as the gibbons search for each other, drawn by their songs, Fan and the rangers move the speakers, and guide the gibbons through the jungle maze until they are within natural earshot. Thanks to a dating app and a wild love song down the telephone, the two Skywalker Gibbons are now about to meet – a match that could determine the future of a species. With this exclusive access to the Skywalker Gibbons in the wild, this film sports never-before-seen behaviour of the existing Skywalker families as well as the bachelors and bachelorettes amongst the gibbons. Two hard years of filming work paint a vivid picture of the gibbons in the wild; of their hardships and triumphs, and last but not least of all the amazing wildlife this patch of China has to offer: hornbills, charismatic red pandas and other species of gibbons racing through the canopy.